They keep all of the light out of the front window. Rich blue color that pairs with any other color in my living room. 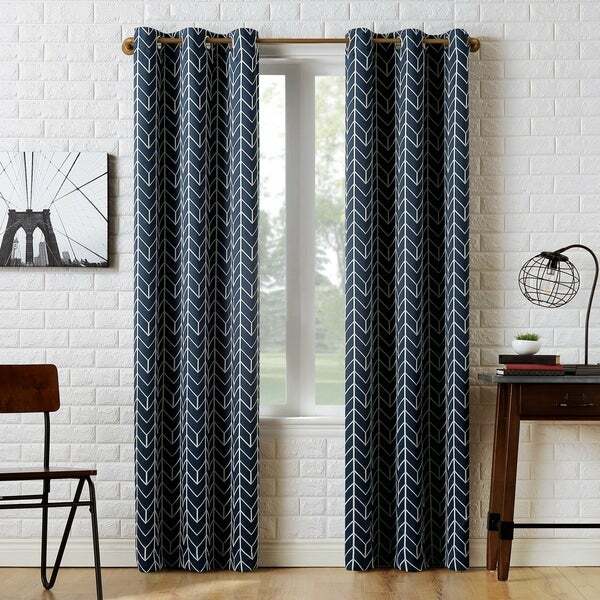 Featuring a contemporary repeating chevron geometric design, Sun Zero Kenwood Blackout Curtain Panels add classic elegance and modern sophistication into any living space. Equipped with built-in metal grommets for easy hanging on standard curtain rods up to 1.5" in diameter. Sun Zero Blackout technology blocks out most outside light, offers outside noise reduction by up to 30%, and decreases energy lost through your windows by up to 40%. Comfort is optimized with thermal properties that help keep summer heat and winter chill out of your home. Hang in your living room for enhanced privacy, or in your bedroom for a sounder, more uninterrupted sleep. Machine wash cold on gentle cycle. Use non-chlorine bleach when needed. Tumble dry on low heat, using a cool iron as needed. This will be a gift and we all are so excited about the Sun Zero Blackout curtains. We got the grommet Kenwood Chevron pattern in Navy. We ordered a total of 3 panels to properly cover and give fullness. We are happy with this order, the color is perfect and is not too dark of a navy blue. I would recommend the Sun Zero Blackout Grommet Curtains. I think you will be happy, too. Just what I was looking for the living space of my home! These curtains are beautiful, functionally and the quality of this brand is great. The curtains block the unwanted sunlight while giving the room a stylish touch! LOVE IT! Love these curtains. The design is perfect and they block out a lot of light, which is perfect since we have sun facing windows early in the morning. I also like the silkiness of the material. They have a little shine to them as well. These look amazing in my freshly painted living room. Brings just the right amount of pattern without looking too busy. Helps block light AND drafts from the cold IL nights. Love them! I love these curtains!! I am buying more. The color is perfect and the quality is great. Thick enough to effectively keep light out, but not so heavy they make the room feel depressing. Great quality curtains, design is super cute. These curtains are beautiful. The pattern is very chic and the material is high quality. They do filter quite a bit of light but not all. You can still see if its daylight with the curtains closed. This is not a blackout curtain. And the fabric feels cheap. Not what I was expecting. This is the second time the order was sent and the second set of drapes have the same defects as the first set,will probably send both sets back for refund. Great price and print - we purchased four curtains at the 84 inch length - but the material was more sheen and sheer than we wanted it to be. I love these curtains. They're a little shiny, which I wasn't necessarily expecting, but they're beautiful. They're the perfect color navy, and the white really pops. I can't wait to hang them up. "When will the navy panels be available in 40x84? Thanks!" We hope to have these back in stock near the end of April. "Does it come as a set or just one panel "